Brosna GAA Club is situated in North Kerry on the Kerry/Cork/Limerick boarder. The first known records of the club date back to Nov. 4th 1888 where a branch of the GAA was formed known then as Brosna (Erins Pride) branch. John Downey was the chairman of this branch. 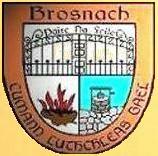 The club was reformed in the early 1970's with records of Brosna teams competing as far back as the 1930's and further. Brosna joined the North Kerry Football board in 1975, and they play county championship football with the St.Kierans District (Castleisland). Brosna won its first county championship title in 1985 when they defeated Churchill in the Novice Final. In 1989 Brosna won the county junior title. The Novice championship title was won again in 2011 with Brosna beating Scartaglen in the final and going on to win the Munster novice title. Since being founded, Brosna have played in all divisions of the senior county league except division 1,and have won division 5 on one occasion. In North Kerry, the club won its first Divison 1 league title in 2010 defeating Tarbert in the final. There were 3 U21 Championship titles in the 80's- 1984, 85 and 88. (2010/2011 Brosna/Knocknagoshel). In 2000 the club won the U21 B championship defeating Ballydonoghue in the final. There were a few senior division 2 titles also including 2002 and 2012.The club won the North Kerry junior championship in 77,81,84,94 and 96.Brosna have not yet won the senior championship. Some noted individuals from the club include the following: Kieran Corridan (RIP), who was a highly respected referee and served as Brosna chairman and a member of the north Kerry board before his untimely death. Patrick Brosnan, an active member of Brosna GAA since it was reformed. He was Kerry U21 selector in 1987/88 and senior selector in 1989. John Murphy, a charismatic character responsible for running the club for a lengthy period. Brosna recently had their first representative on the Kerry County Board with Tim Murphy being elected as Development Officer of the board in 2012. A number of locals have played with Kerry at various levels. Kerry Senior- Brendan Lane the long serving goalkeeper, U21- Mossie o Donnell, Captain of Kerry U21's 1967, and JJ Canty Minor-Mossie O'Donnell, Jimmy Keane, Tim Geaney, John Haugh, Eamon Kiely, Mike Finnegan, Adam Barry. Junior: Fr .Pat Downey, George McAuliffe, Tom McGoldrick, Flor McAuliffe. Brosna's Club facility was officially opened in 1996 by Joe McDonagh, GAA President elect. A senior football game between Kerry and Kildare marked the opening preceeded by Kerry v Limerick in a senior ladies game. The late John Egan was guest of honour on the day with people travelling from all over the globe to celebrate the Clubs hard work and history. All in attendance witnessed the fine facilities and the club has gone from strength to strength since then redeveloping the playing pitch to one of the finest in the county at present. The club has recently purchased a new training pitch adjoining the current field and hope to develop it in the near future. The Club Lotto, one of the first in the county, continues to provide a vital income and the people of the local and surrounding communities deserve credit for their continued support.